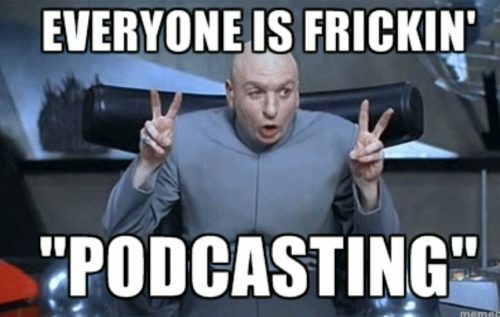 Podcasts are gaining in popularity, big time. The soniverse (yes, I just made this word up) is exploding with podcasts in multi forms. So, let’s focus the spotlight on their burgeoning heyday and sort out how podcasting hasn’t killed the radio star, but reconstituted him/her onto another platform. As a voiceover talent, podcasts bring many opportunities for my work. I have been hired to provide intros and outros for financial podcasts, special guest intros for news and entertainment podcasts, story lead-ins for relationship podcasts and narrating whole podcasts for the pharmaceutical and health industry. -A young medium, the first podcast, “Radio Open Source,” then called an “audioblog” by its initiator journalist, Christopher Lydon happened only 15 years ago in 2003. The name came from iPods. -In 2015 Apple’s IOS 9 made streaming ubiquitous. That plus smart phones being the mobile device of choice, helped burst the podcasting scene wide open. -Edison Research published a listener growth from 39 million Americans in 2015 to 54 million podcasts listeners in 2016. -Advertisers have noticed. In 2016, they spent around $35 million sponsoring and advertising on the medium. -In fact, podcasting’s distinction is that it is a mobile first platform. 71% of users listen to podcasts on their mobile devices, as opposed to 29% who listen on computers. 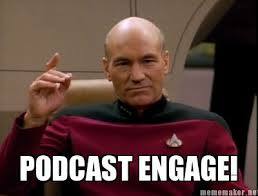 Podcasts are curated content you can plug in while still being active. 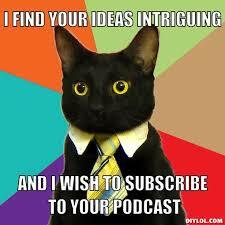 Instead of guilty sifting & surfing & straining your eyes, the podcaster has done that for you. You can simply be enlightened in an entertaining way. They’re bingable – With the emergence of streaming and Netflix and other content providers releasing whole seasons of shows at a time, we’ve discovered we like our media in large quantities. In fact, according to a 2014 Netflix survey, 73% of us define binge-watching as viewing 4 or more episodes at a time and 61% of us do that. But binge-watching comes with guilt. (Inner monologue be like: “I should have cut the grass, I need groceries, how many calories would I have burned if I’d walked the last 2 hours instead of caught up on Kimmy Schmidt?”) With podcast binging you can still be active. You travel, walk, exercise, feed the dog, etc. while learning being entertained, feeling productive, not wasting time. Of podcast consumers, 69% listen to 5 shows a week. 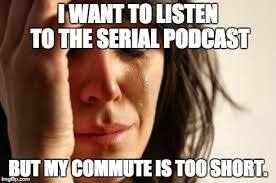 Think of it as 5 weekly commutes or 5 times a week in the gym. Why do we love them so much? Improved technology and bigger budgets has led to better quality and content. Originally the domain of independent journalists and radio announcers, they’ve splintered into manifold topics, each accruing a more refined audience at every level. They’re trendy. They’re smart candy. Instead of some of the low-level content that populates the higher rankings of the most popular YouTube channels. They’re made for mobile consumption, and support multi-tasking, reaching audiences when/where others can’t. They encourage and cultivate relationships between journalists/podcasters with listeners because they use my favorite instrument of creativity, the human voice. Steeped in personality and brimming with engaging content, podcasts are next-level tools of intrigue. I’m a voiceover artist, often called upon to intro/extro, or read narration for podcasts and have an affordable team in place for editing them as well. These mobile shows are audio jewels. Please contact me if you need voice or podcasting editing services. Nice, Kim. Your info is so “on target”, always.